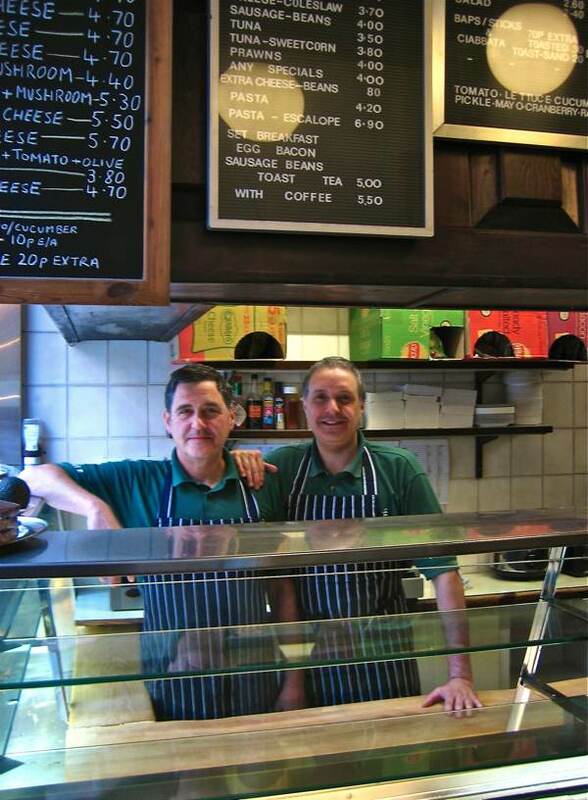 These are the Rapacioli brothers – Sergio & Dinos – who run the celebrated Regis Snack Bar, nestling at the foot of the Lloyds Building beside the entrance to the Leadenhall Market in the City of London. As a point of reference, Sergio is the one who resembles George Clooney while Dinos has the rugged Bruce Willis features. “I’ve been here thirty-five years, since the mid-seventies, and Dinos – my younger brother – he’s been here a couple of years less. My father and mother, Guiseppe & Angela Rapacioli, they bought the place in 1968 from one of my father’s uncles who had it since the fifties. 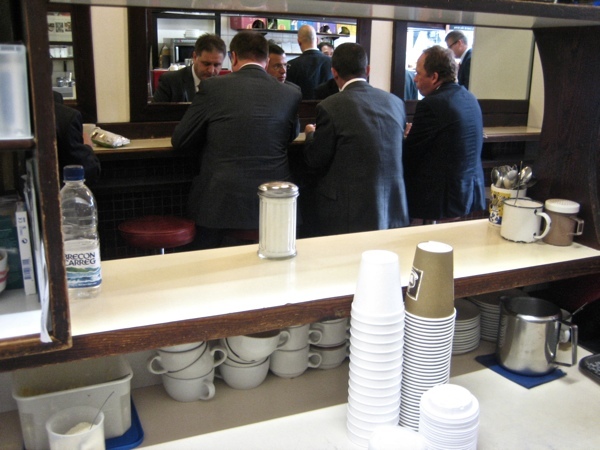 I think there has been a cafe here over eighty years. I did a couple of things before I came here, I was a diamond cutter in Hatton Garden, and I worked at Browns in South Molton St, buying and selling fashion. At that time, we were the only people in London stocking Armani and Versace. I used to go the shows in Milan and Venice, and it was a great time – all the parties with models and the designers. I did it from twenty to twenty-four and I enjoyed that part of my life. But my father kept saying, “You’ve got a great business here,” and the pay wasn’t great, so I gave it up and came to work at the Regis Snack Bar. It was a sure thing and it’s what I’m good at, and it’s very satisfying when people come back again and again. We start at six and go home at four, five days a week. The customers here are pleasure to deal with, it’s a buzz, and the day goes by. I was born in Holborn. When we were children, my parents had a restaurant in Theobalds Row but in 1969 we moved out to East London. When I started here in the City there were still a few old guys in bowler hats and we used to open until six because you’d get the Lloyds’ crowd in for tea and a slice of cake in the late afternoon. 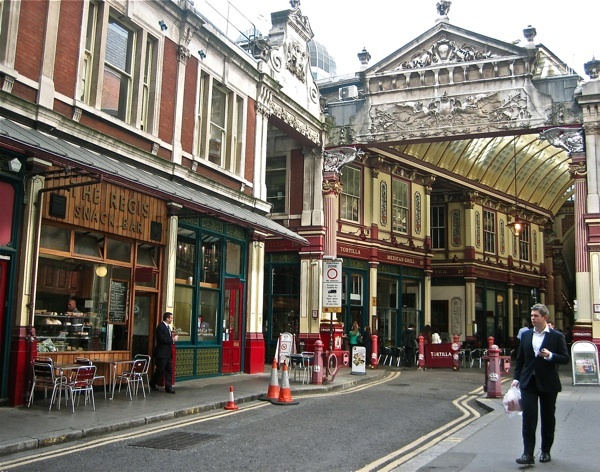 This market had two butchers then and a couple of fishmongers, they had been here for years but they all left because of the high rents. It was fabulous at Christmas with all the pheasants hanging up. The boom was in the eighties, people stuck credit cards behind the counter and drank champagne all day. Now, there are some people don’t come in to buy sandwiches any more, they’re bringing packed lunches from home, but most of the people in the Square Mile, their spending hasn’t changed. 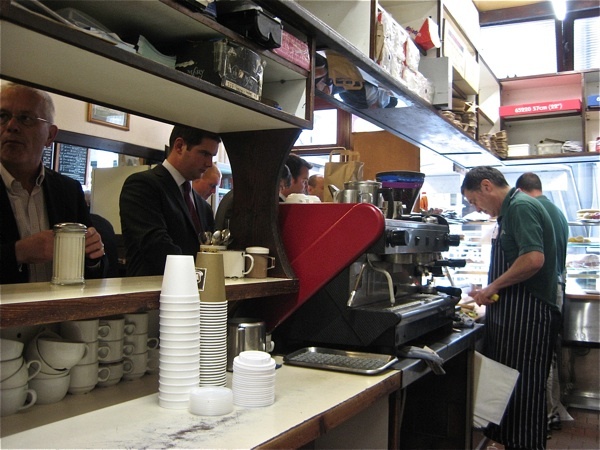 It got quieter at one point because people got made redundant and a few regulars disappeared yet, for those who kept their jobs, it’s business as usual. 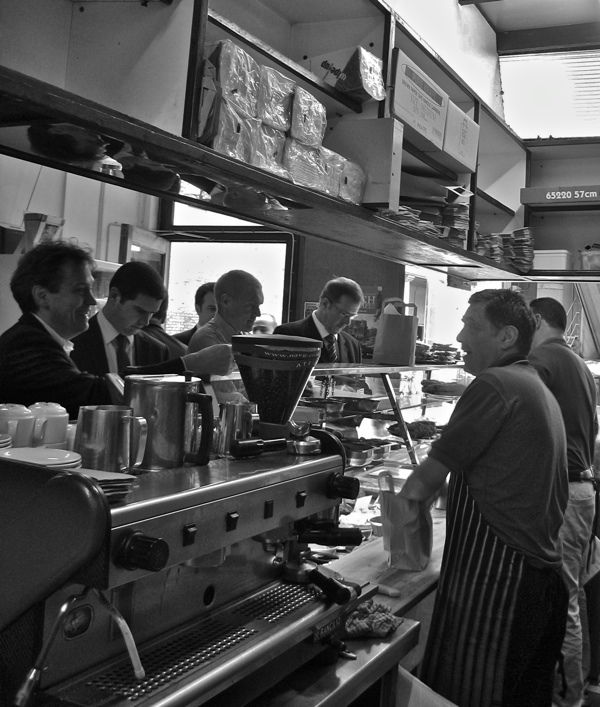 It’s a busy little community here and we still have plenty of regulars who are keeping us going through the recession because we’ve been here such a long time. They all know us by our first names. Sergio told me his grandmother, Domenica, was born in London but the family returned to Italy when war broke out. As the only English speakers in their remote rural community, any British or Allied soldiers and airmen who needed to hide were brought to them, and the family offered shelter until these men could escape to safety. 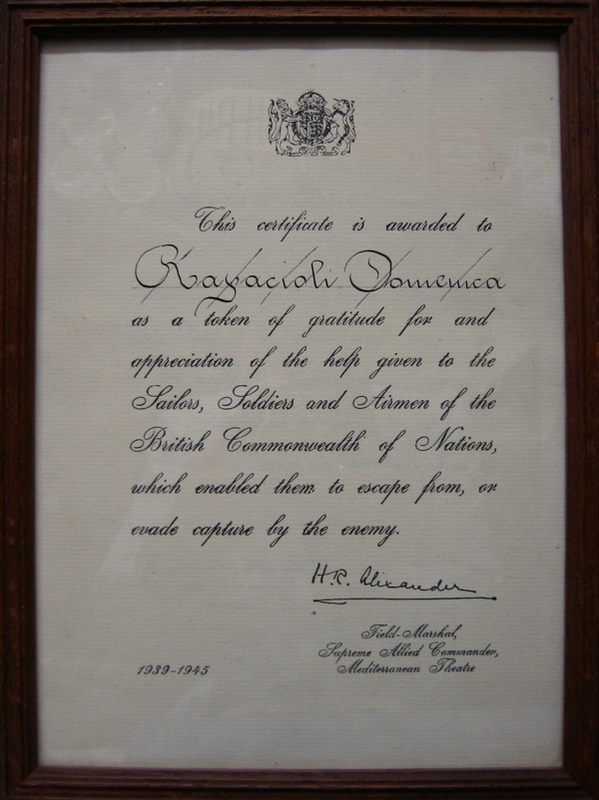 A framed certificate of commendation hangs today in the Regis Snack Bar in remembrance of this extraordinary act of bravery and Domenica’s grandsons uphold the Rapacioli tradition in their own way by offering a refuge of civility in a very different world. Around one o’clock, the men and women in suits come piling out of Richard Rogers’ stainless steel Lloyds building, escaping to cross Leadenhall Place into the cosy wood-panelled chalet-style Regis Snack Bar with its Gill typeface upon the fascia. 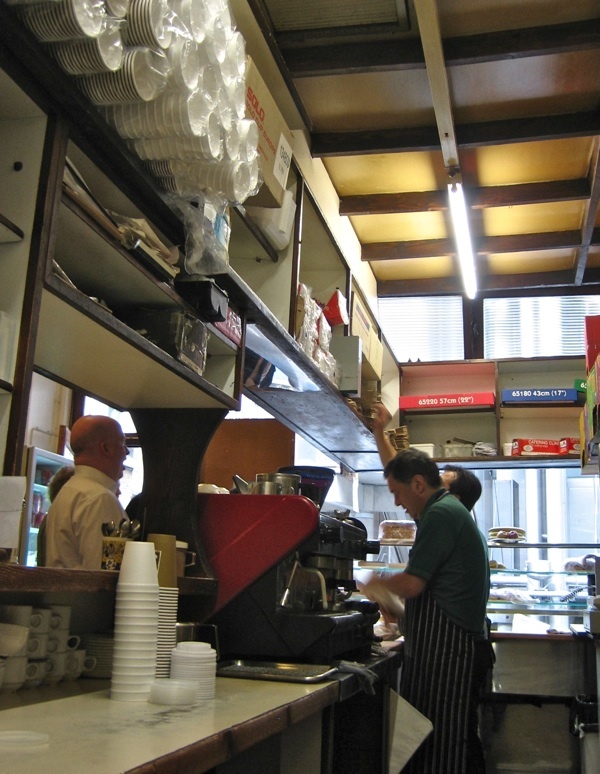 Hungry for hot toasties and breaded escalopes in ciabatta, and hungry for the affectionate daily ritual of name-calling at the last classic cafe in the City of London. Sergio & Dinos’ grandmother Domenica Rapacioli was a war hero, sheltering airmen shot down in Italy. 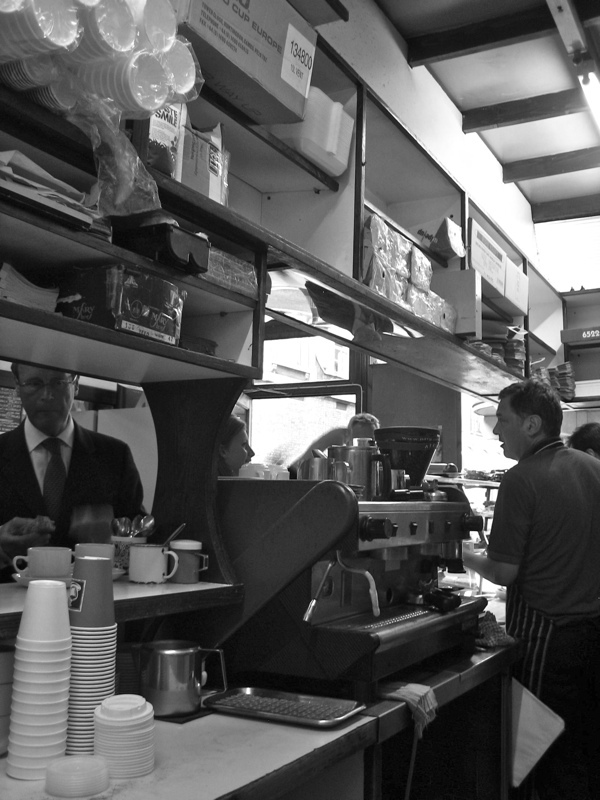 I discovered your blog recently and it’s such a breath of fresh air, your articles really got under the skin of Spitalfields and the establishments in it, rather than just reviewing the coffee, or taking photos of piles of cakes. What nickname has been assigned to your goodself, or is it a state secret? I would love to meet you guys sometime, given the very extended family connection. I am not too far away in Oxford, so I get to London every so often.